Summary: Learn simple 3-step process to treat plantar fasciitis heel pain. In this video you will learn effective exercises to fix plantar fasciitis pain for good. Plantar fasciitis is a common condition that many active people face. It causes heel pain that makes you feel as if someone is stabbing you with a knife in your foot. If you’ve ever experienced this extreme discomfort then you know exactly what I am talking about. Heel pain is usually at its worst in the morning when you first get out of bed. 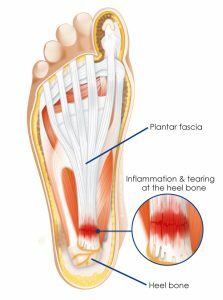 Plantar fasciitis affects many runners and athletes. Being on your feet often (for example working as a waiter or in a factory) is another risk factor. Women who wear high heels often suffer from plantar fasciitis. Pregnant women can experience bouts of plantar fasciitis especially during the third trimester. Overweight people can develop plantar fasciitis due to increased pressure on plantar fascia ligaments. Wearing wrong shoes (soft soles, poor arch support) especially during exercise can cause heel pain as well. My personal first experience with plantar fasciitis happened when I got into Insanity by BeachBody and did these workouts 5 days a week. Insanity is a HIIT-style workout that you can do at home (I am no longer doing it consistently, I have switched my workouts around quite a bit). It involves a lot of jumping – think jumping jacks, squat jumps, jump lunges, high knee runs, frog jumps, burpees – you name it! After about 1 month of this insanity (pun intended !) I woke up one day and barely could walk to the bathroom. The pain in my feet was excruciating! First I thought that I had majorly injured a muscle or tendon. I had never experienced this kind of pain before. After hobbling around for about 30 minutes the heel pain got better. That’s when I realized that this was not a major injury but rather an overuse injury on my part. After all of the crazy jumps during my Insanity training my calf muscles were extremely tight. I have neglected my calf muscles to the point that they had built up painful muscle knots. Tight calf muscles are the most common cause of plantar fasciitis. 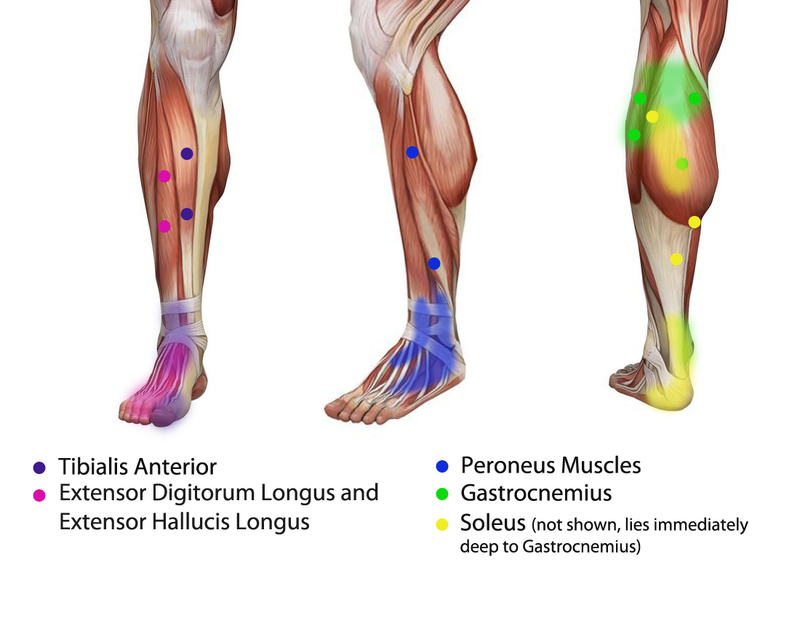 Another cause are trigger points in the calf muscles that cause pain in the heel area of the foot. Most of the time tightness of the calf muscles will be accompanied by trigger points in the same area. It’s a chain reaction that has to be broken in order to achieve lasting relief from foot pain. A few weeks ago my husband started complaining of foot pain. Prior to that we were doing a lot of hill running while also working out at the gym. By this point I was an experienced “heel pain survivor,” so I knew exactly what to do. Get ready for the video below! In the video that I am sharing with you today you will see the exact routine that I showed my husband to treat his heel pain. You will learn the 3-step process that I use to treat plantar fasciitis pain. Step 1 – Release trigger points in the calf muscles. Releasing trigger points makes your stretching exercises more effective. It’s like getting a good deep tissue massage before your stretch. All you need is a couple of massage balls – get them in our store! RLZ4 – extra firm lacrosse massage balls, deep pressure with almost no give at all. Step 2 – Soften Foot Fascia. Now it’s time to work on the area of the foot that is hurting. Use massage balls (firm spiky ones are my favorites for this exercise) to increase blood flow to the sole of the foot and soften plantar fascia. Spiky Massage Balls (available as part of the Therapy Massage Ball Set) – soften plantar fascia and increase blood flow to the area. You will feel like walking on air after rolling your feet on these! Step 3 – Stretch. Now you are ready to stretch your calf muscles. Because you started with the releases your calf muscles are already primed for an effective stretch. While the stretch will feel intense, it should not feel as painful as it would have been if you skipped all the release work. How often should I repeat Plantar Fasciitis Exercises? Repeat this sequence every day when you are suffering from plantar fasciitis. Keep doing it every couple of days once the heel pain is gone. Make it part of your warmup or post-workout routine to keep your calf muscles supple and your feet pain-free. Keep in mind, in order to keep plantar fasciitis from coming back you need to eliminate the main cause of this condition. If your calf muscles are tight because of your work or workout schedule then you need to keep them loose by stretching constantly. If your calves are tight because you are not wearing the right shoes – you need to go shopping for a new pair! P.S. My husband and I discovered that his pain was caused by his running shoes. After he diligently repeated the plantar fasciitis exercises above for a week and switched to a different pair of running shoes his plantar fasciitis pain has been completely healed (and we still keep on running the crazy hill in our neighborhood.) It’s been over a month since we recorded the video, the heel pain is completely gone.